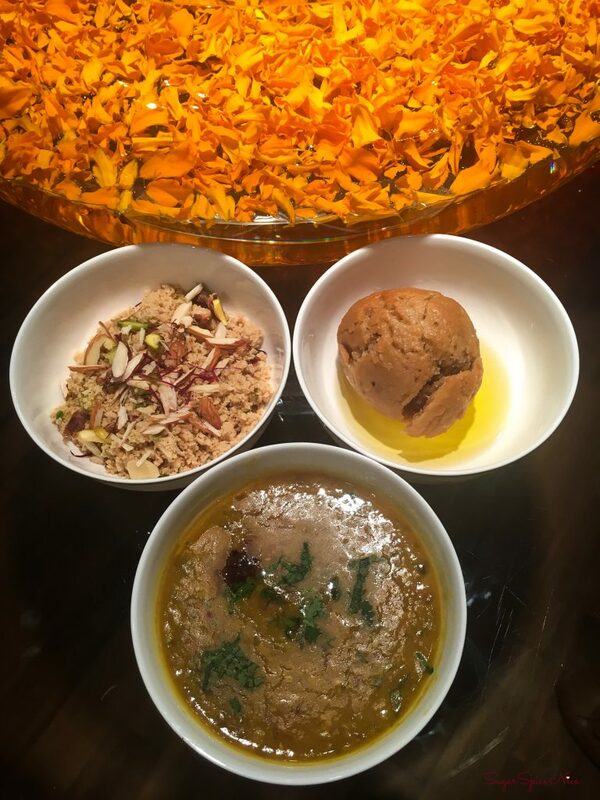 If you love good food, then the Rajasthani Food Festival at Jamavar, The Leela Mumbai needs to be on your to-do list. 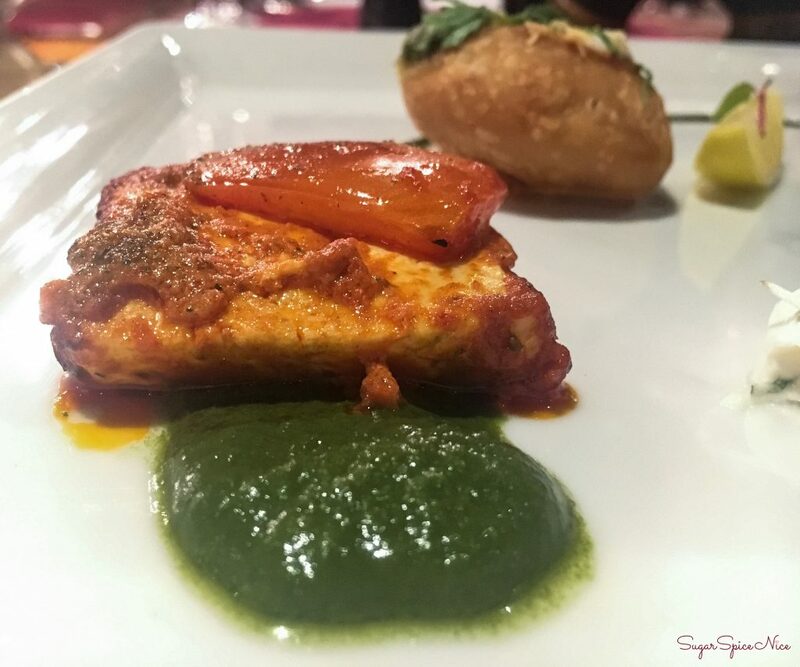 I recently had the opportunity of dining at The Leela Mumbai. 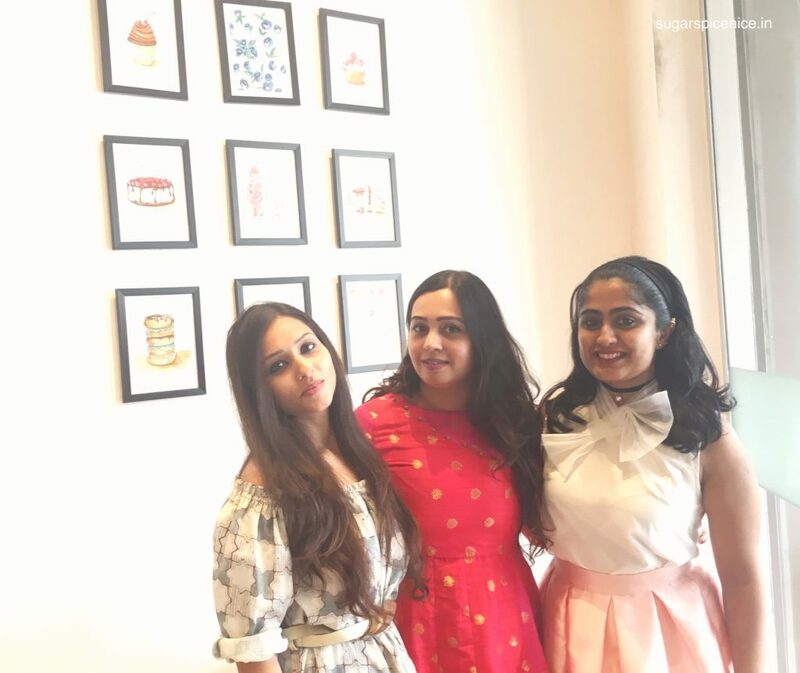 This was my first brush with the brand in my own city and I was so happy that I got to experience a preview of their special Rajasthani Menu. Here’s a little snippet from my visit. 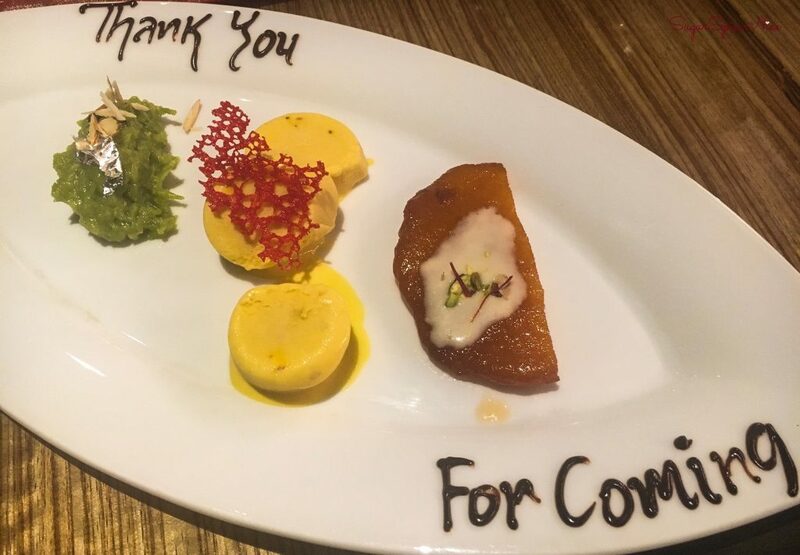 The Chef and the staff at Jamavar had prepared a complete meal; from starters to mains and finally dessert – everything was stellar. 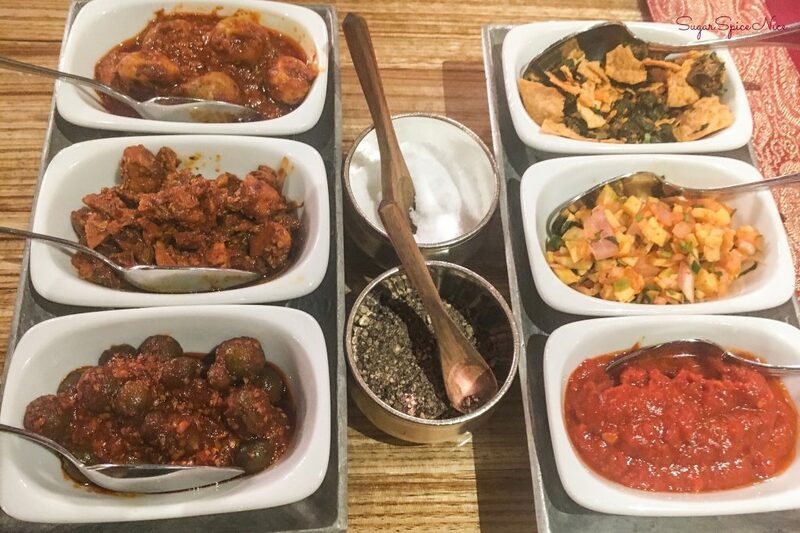 There was a selection of pickles and chutneys. 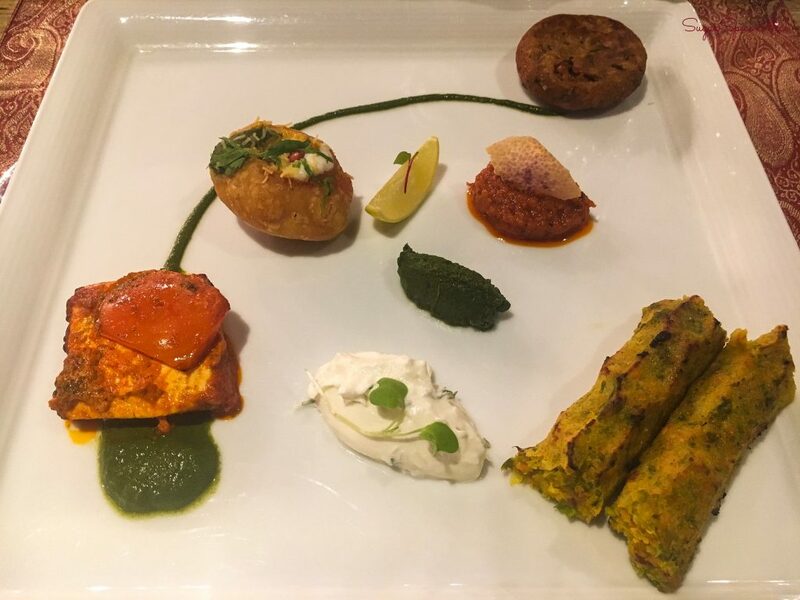 The bhindi with chura papad and the kairi and pyaaz kachumber (of sorts) stood out for me here. Then came the appetizers which were not only so beautifully plated, but also tasted divine. 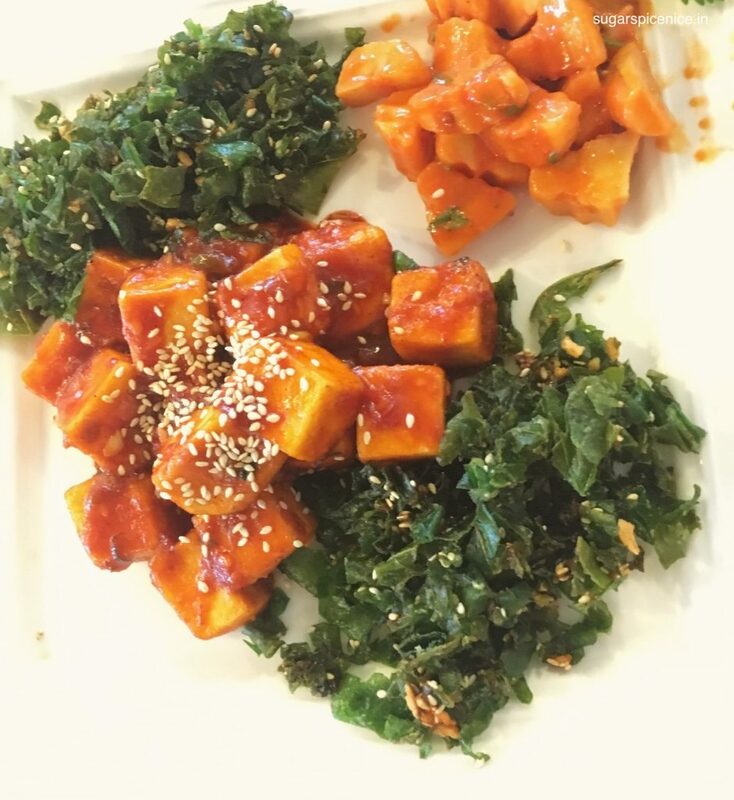 A spicy marination on soft paneer chunks. This has a fiery flavor, but is delicious. I could definitely eat a plateful of this! 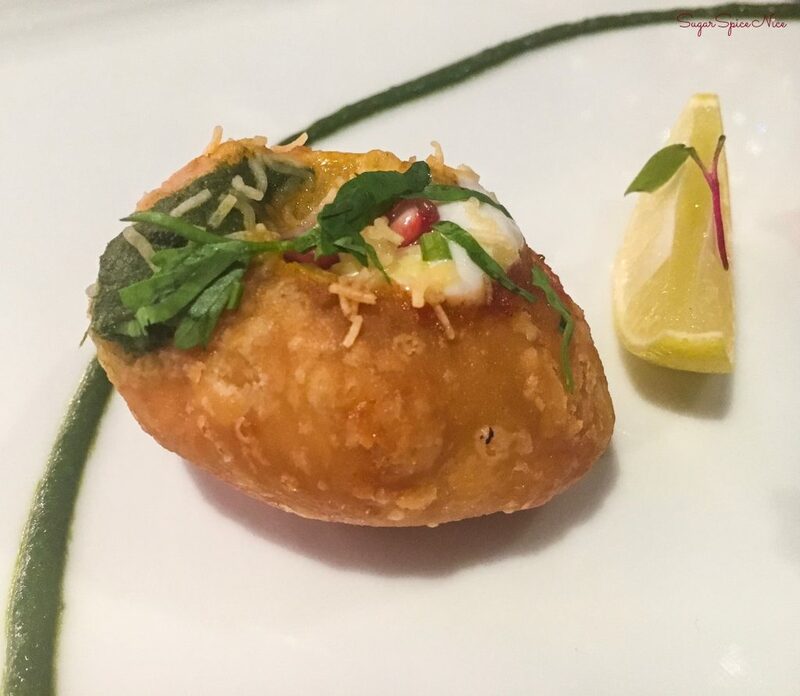 The flavor of the chutneys and the crunch in the crust of this kachori totally did it for me. 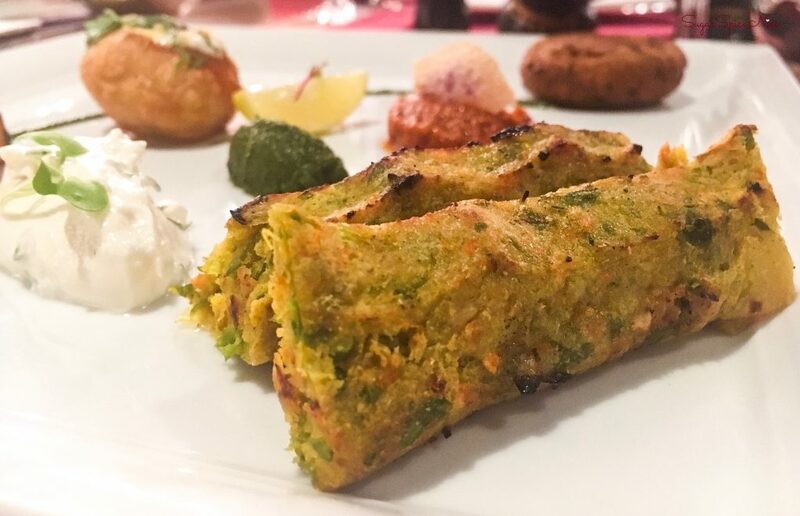 A seekh kebab, that was slightly on the sweeter side. A tikki made from walnuts and arbi; never knew it could be so delicious. 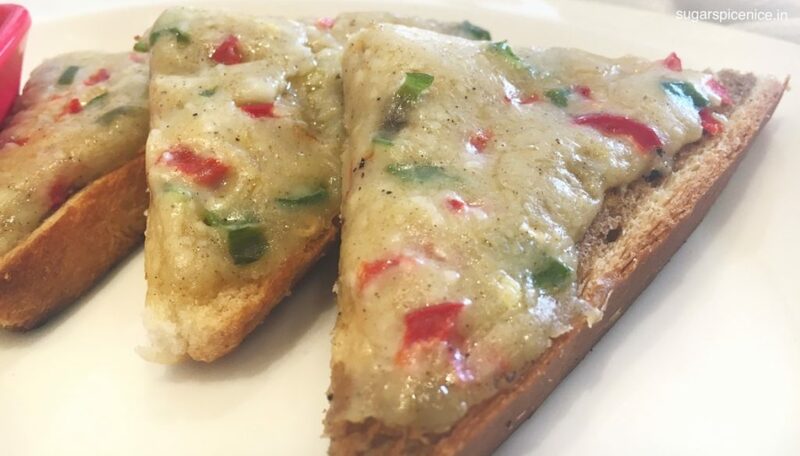 Panner, capsicum, onion in a spicy gravy. I highly recommend trying this out. 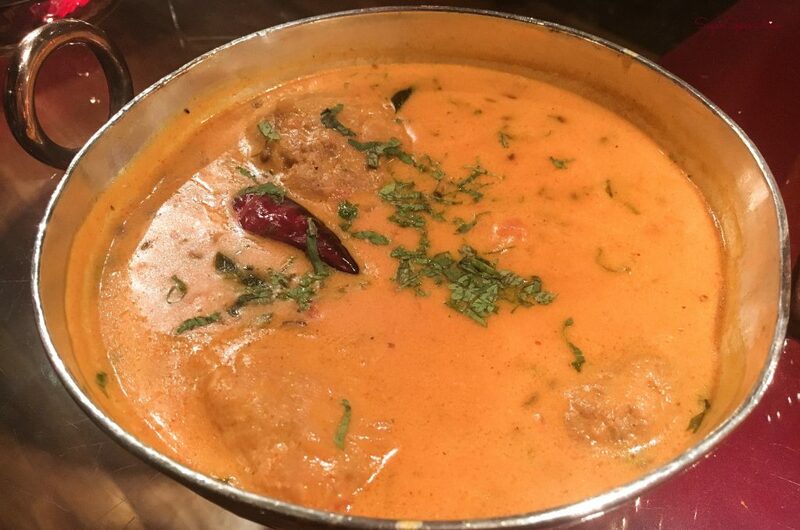 Big round dumplings or Gatta, is what is known as the Govind Gatta Curry. The gravy is delicious. Very different tasting kofta. Enjoyed these with a selection of kulcha and roti. For me, this was probably one of the best Dal Baatis I’ve had in a long time. The churma itself was so rich and while the baati was immersed in ghee, it was exceptionally tasty. 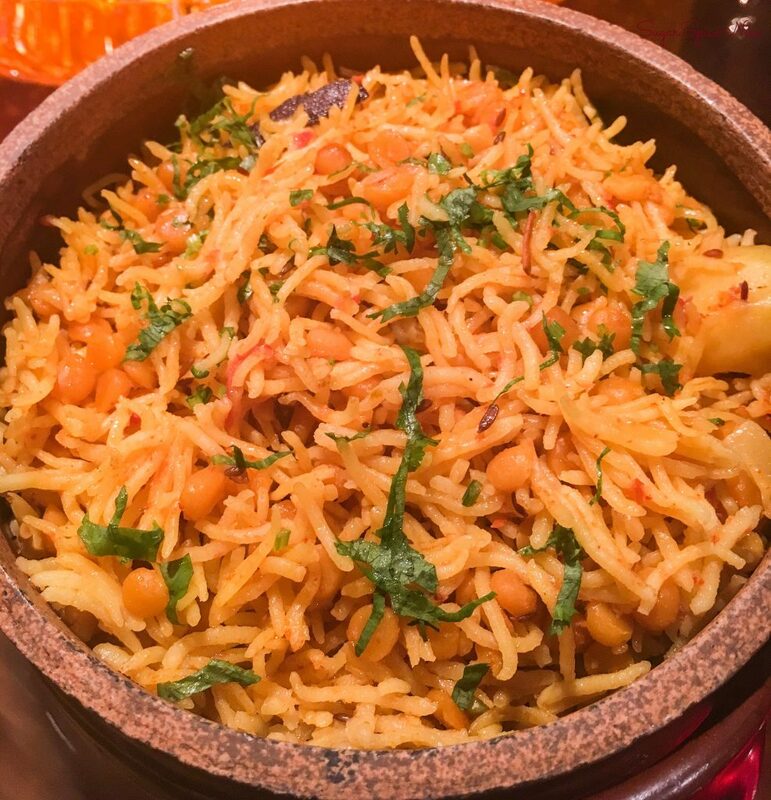 A very simple, yet flavorful preparation of rice with chana dal and little potato pieces. The flavors of cinnamon and peppercorns in this took the dish to the next level. I tried some pretty interesting dessert here as well. 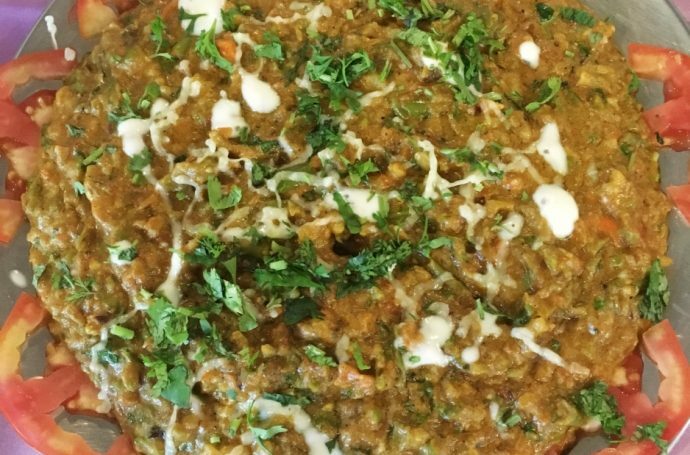 Halwa made from green peas. If you like the taste of raw green peas you may like this one. 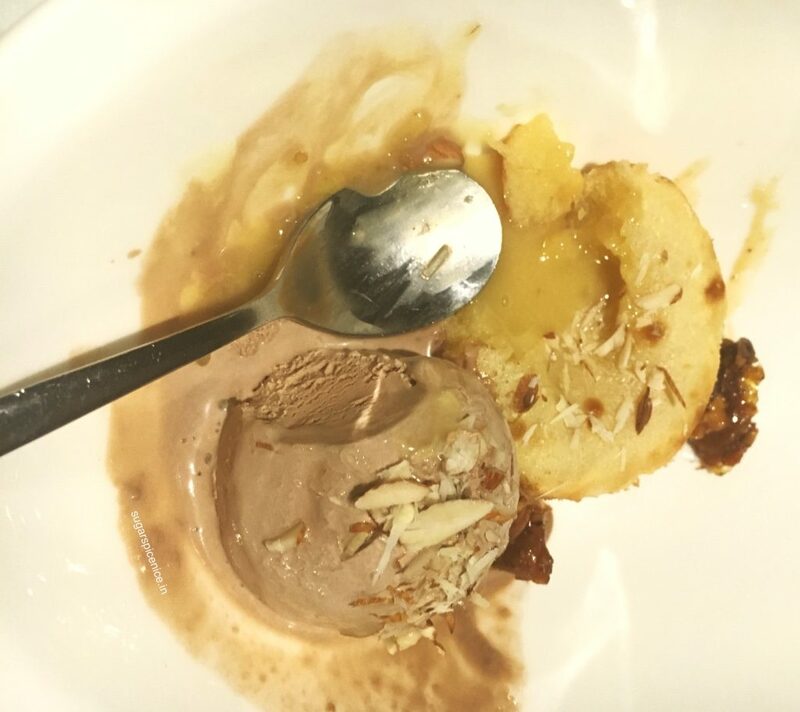 Probably the creamiest kulfi I’ve had in a long time. This was exceptional. Malpua topped with a thin layer of rabdi. 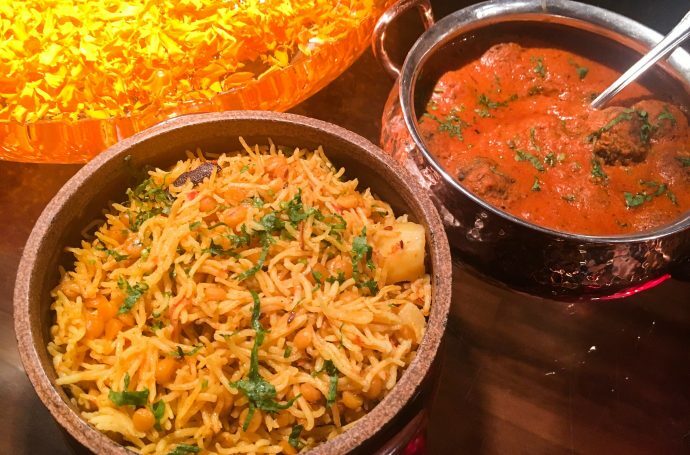 If you want to try out some delicious Rajasthani food in Mumbai, then make sure you check out this festival that is on until the 31st July at Jamavar, The Leela Mumbai. I absolutely recommend it. 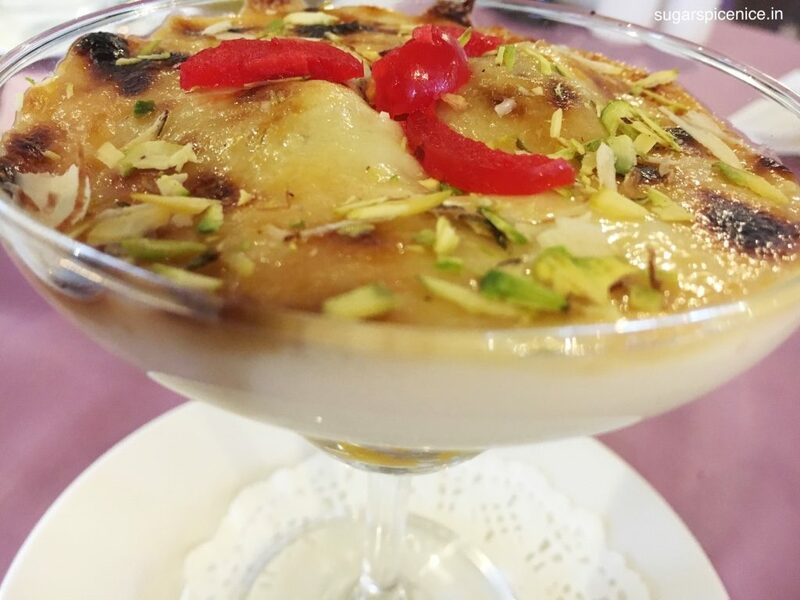 There are so many options for getting your dose of desserts in Mumbai. But if you want something quirky and fun, then try these! 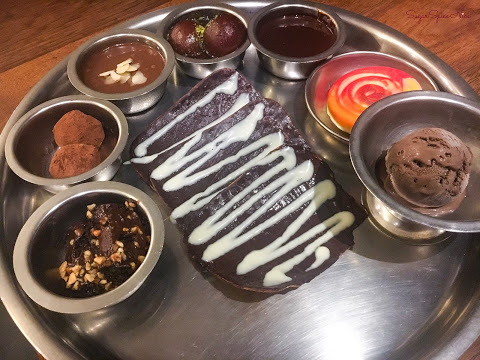 Trying out the quirkiest desserts in Mumbai. Watch! 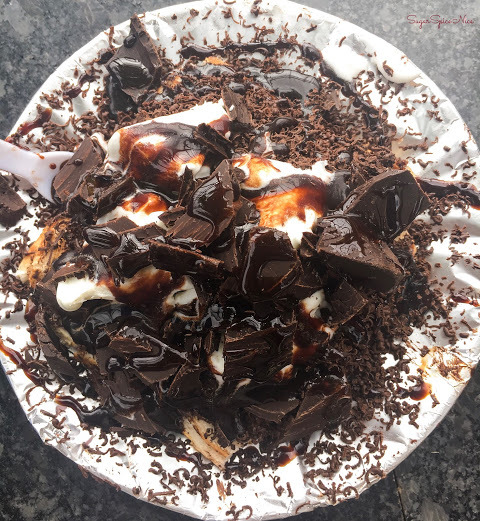 A 3 layered sandwich, with butter, grated dark chocolate, some Hersheys, some more dark chocolate chunks and a scoop of vanilla ice cream. 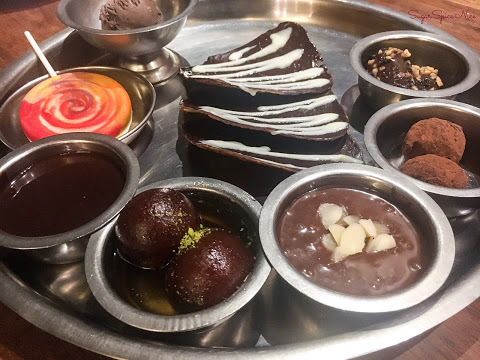 A whole thali (traditional Indian meal) that is made from Chocolate! 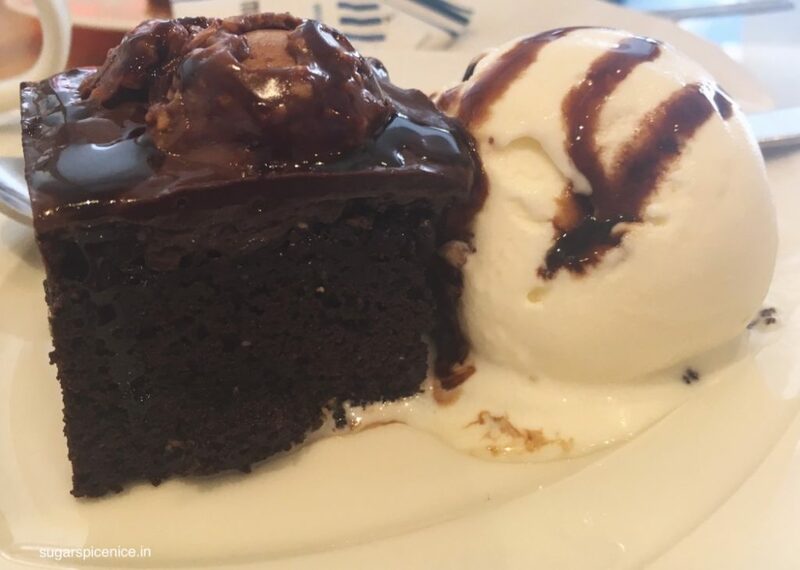 It contains Chocolate Khakra, Chocolate Soup, Gulab Jamun, Ice Cream, Swiss Roll, Truffle Balls, Chocolate Lollipop, Chocolate Shrikhand…phew. It’s basically a dessert buffet! If you want to try a lot of chocolate in one go and / or have many people splitting a dessert, this option could work well. 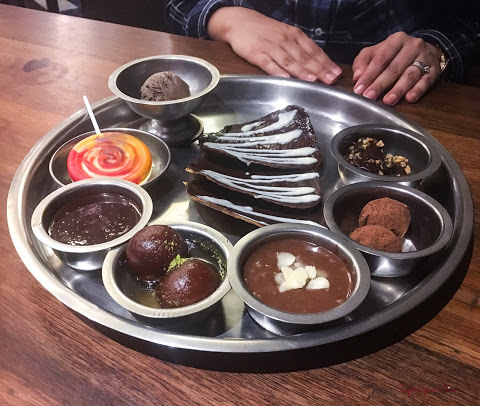 To be honest nothing in this Chocolate Thali is to die for. 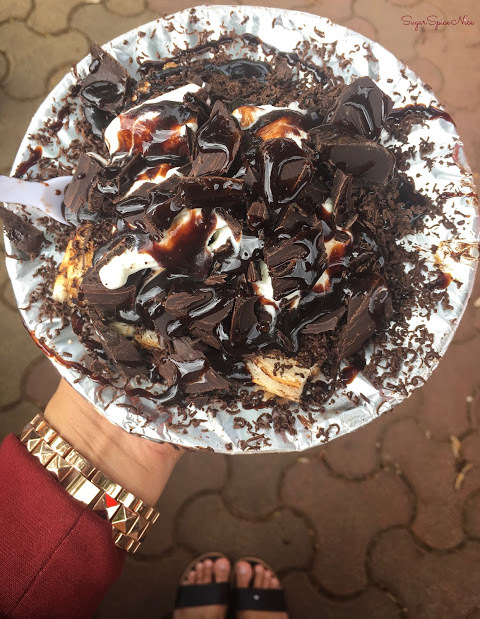 However, you could try it just for the sheer experience, and the gluttony! 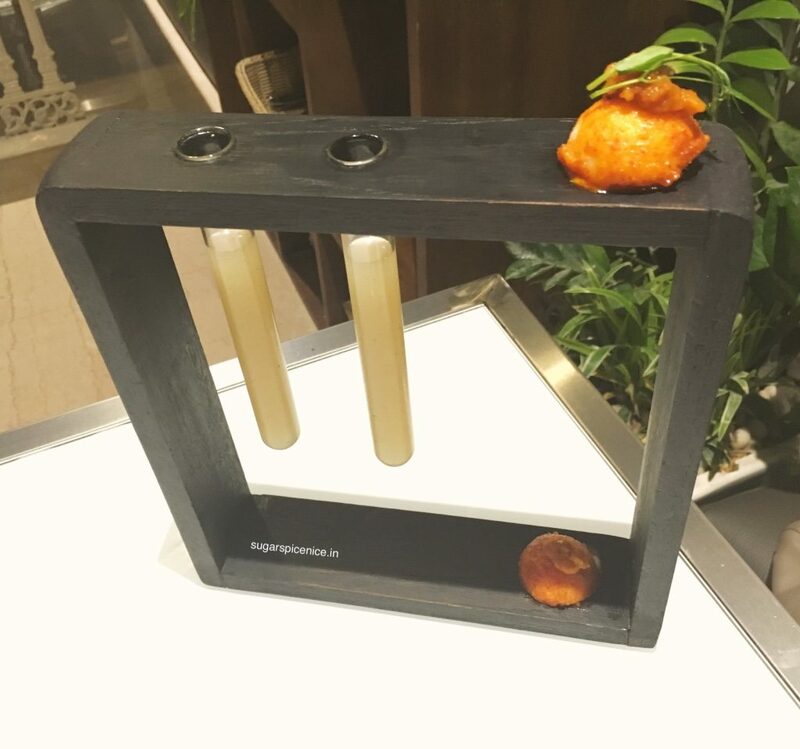 An ice cream made from edible carbon. Edible carbon has medicinal properties and many health benefits. 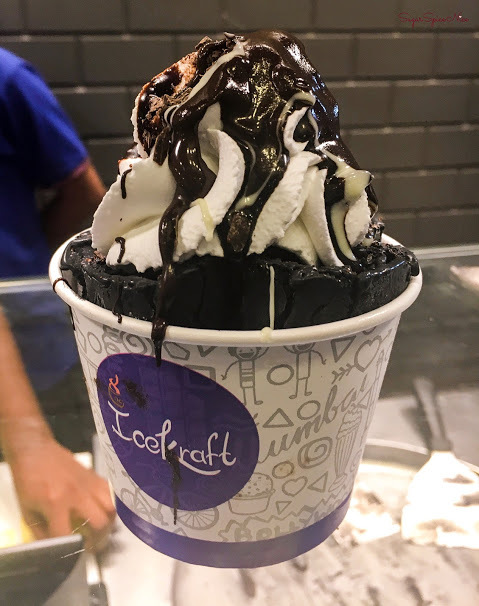 You can try this ice cream made from it, which is also known as Triple Threat Ice Cream with various toppings and add-on flavors. It’s quite unique in itself. So YES I would totally recommend trying it out. 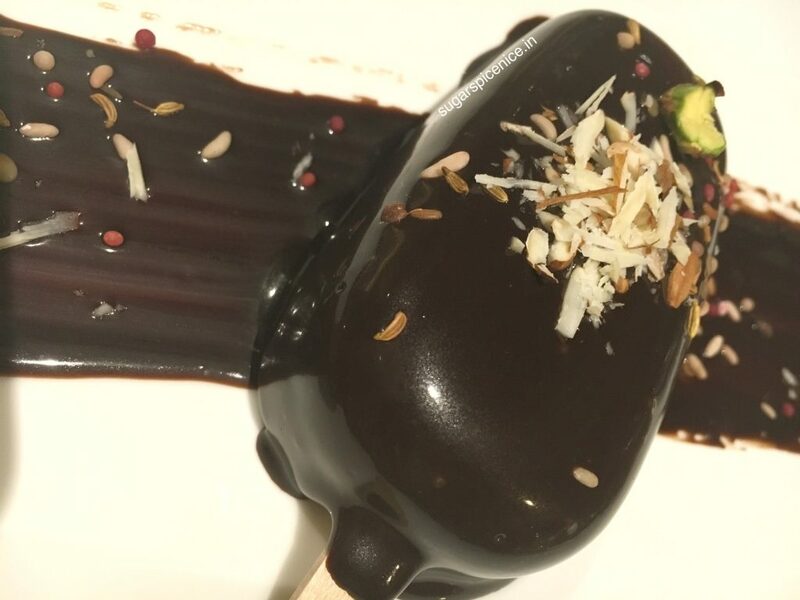 So those were some of the quirkiest desserts in Mumbai, that I tried very recently. I do plan to do a second part to this series and If you have suggestions on places that I should visit then do let me know in the comments here. 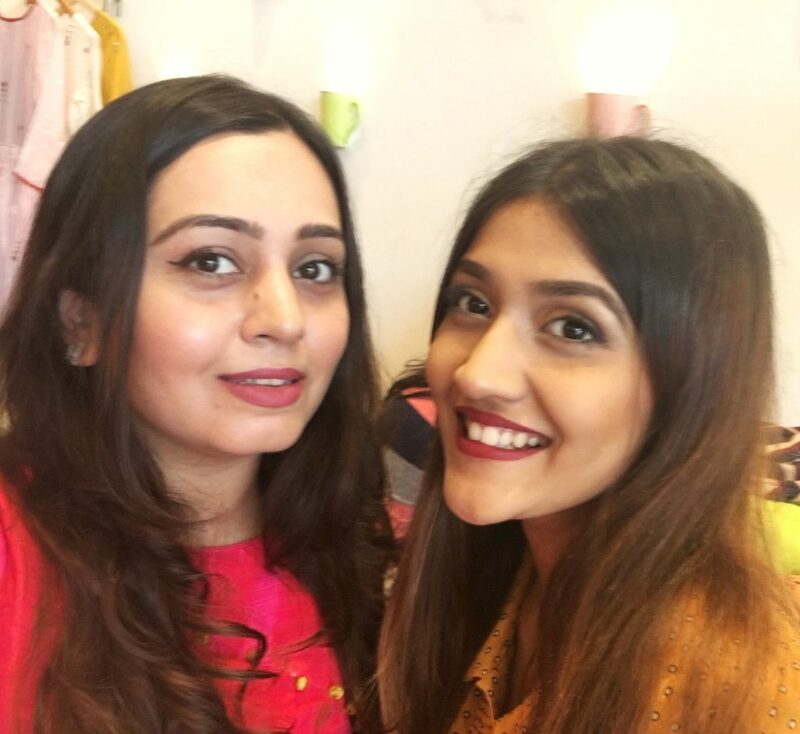 The Koffee Works – where coffee meets fashion! Hi everyone! I hope you are doing well. 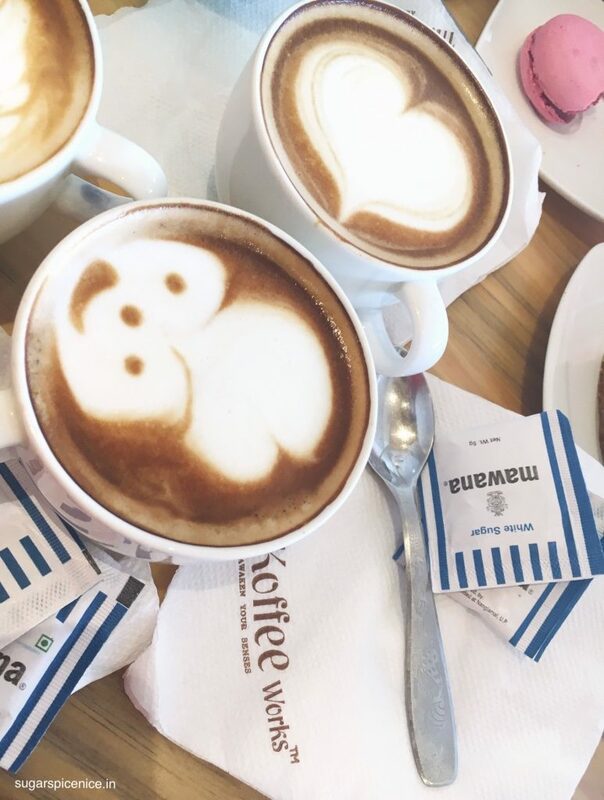 I visited this place called The Koffee Works a while back and I had a really awesome time. 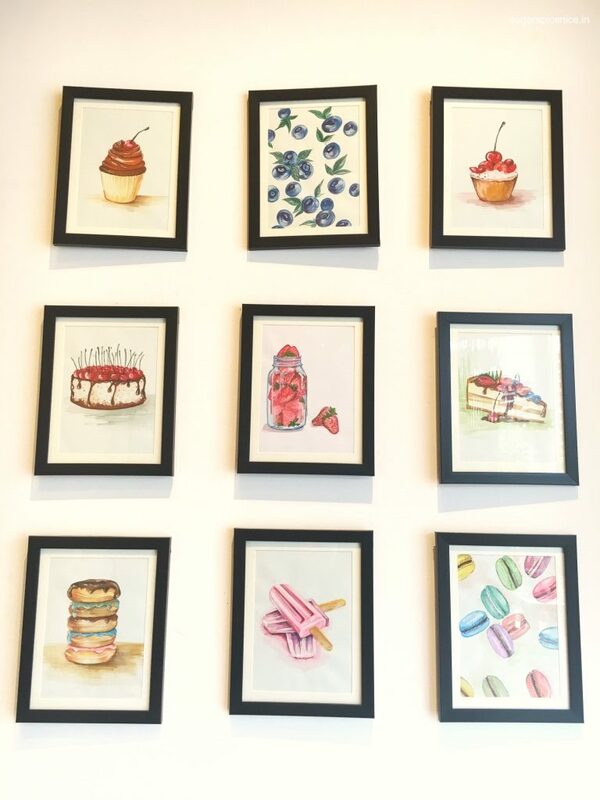 Firstly the place itself is pretty gorgeous – cozy interiors, good coffee and amazing dessert. And combine all of this with a fashion exhibition that was going on here – I had a great time. You can see my whole experience of The Koffee Works in this video. 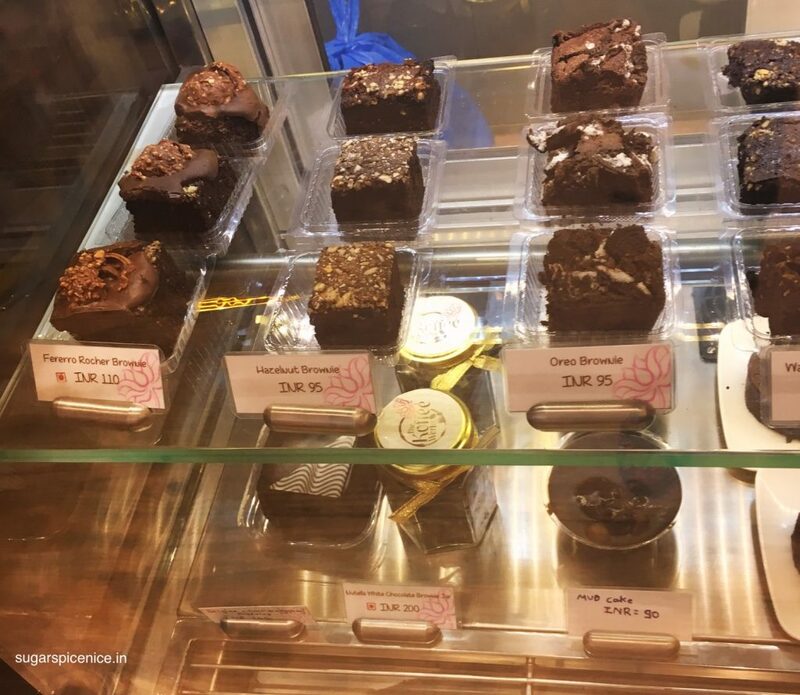 If you are in and around Kharghar, definitely do try and visit The Koffee Works. It’s an amazing place to chill and hangout. 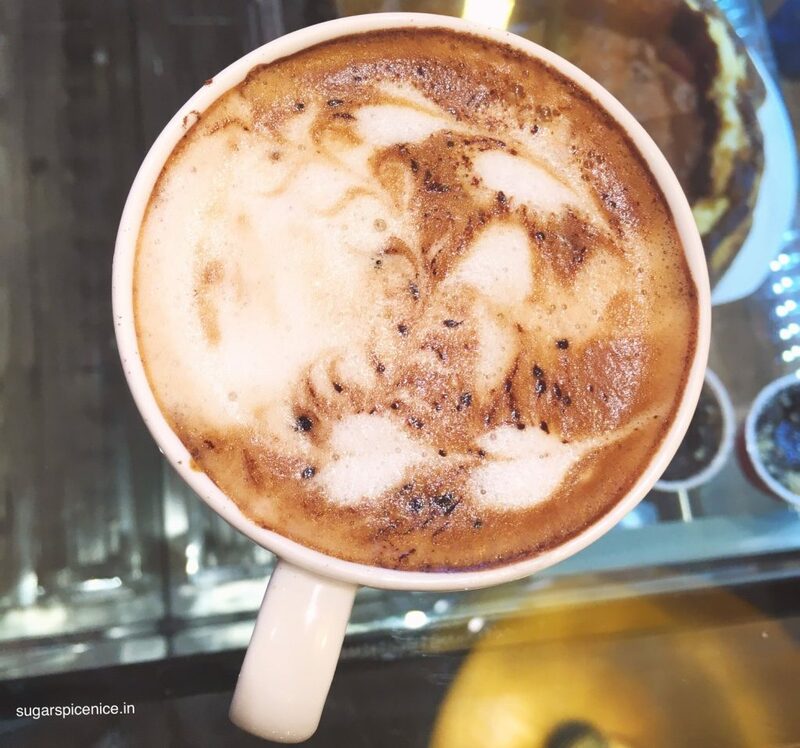 You get some really good coffee – which by the way is sourced from the owners’ family coffee estate. 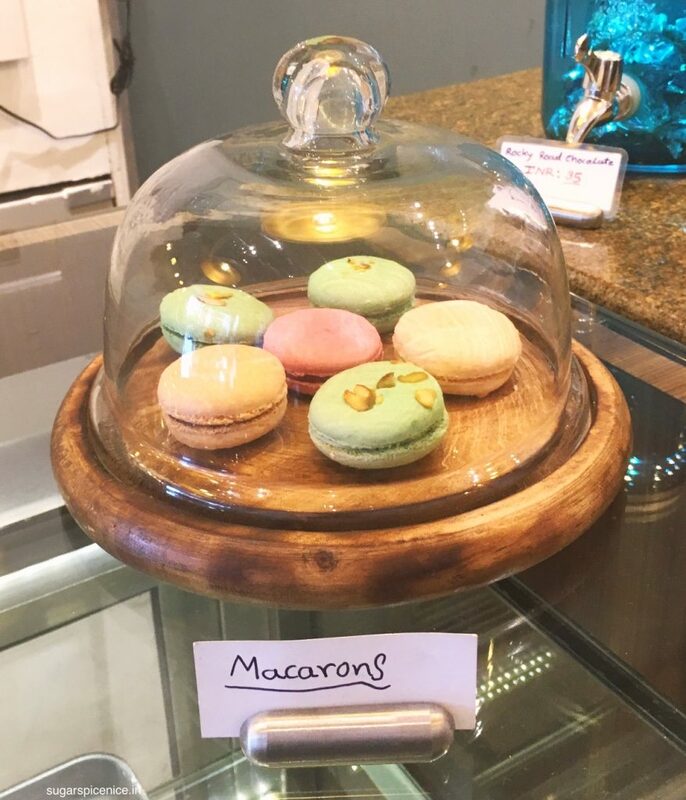 And even their sweets and savories are pretty delicious. 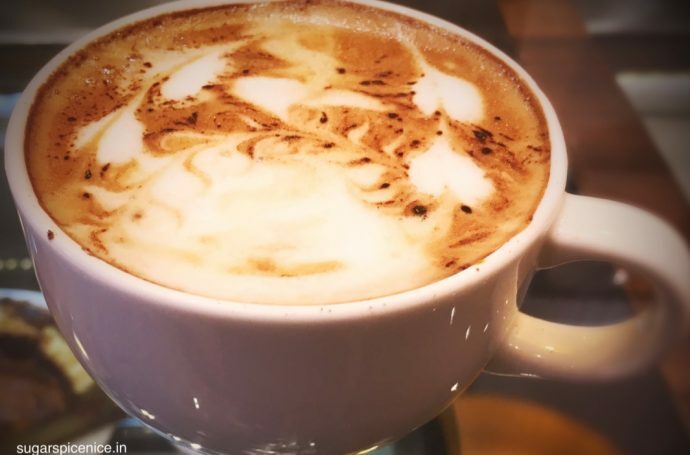 I absolutely recommend trying out the hazelnut cappuccino at The Koffee Works. Even their brownie in a jar is absolutely awesome. 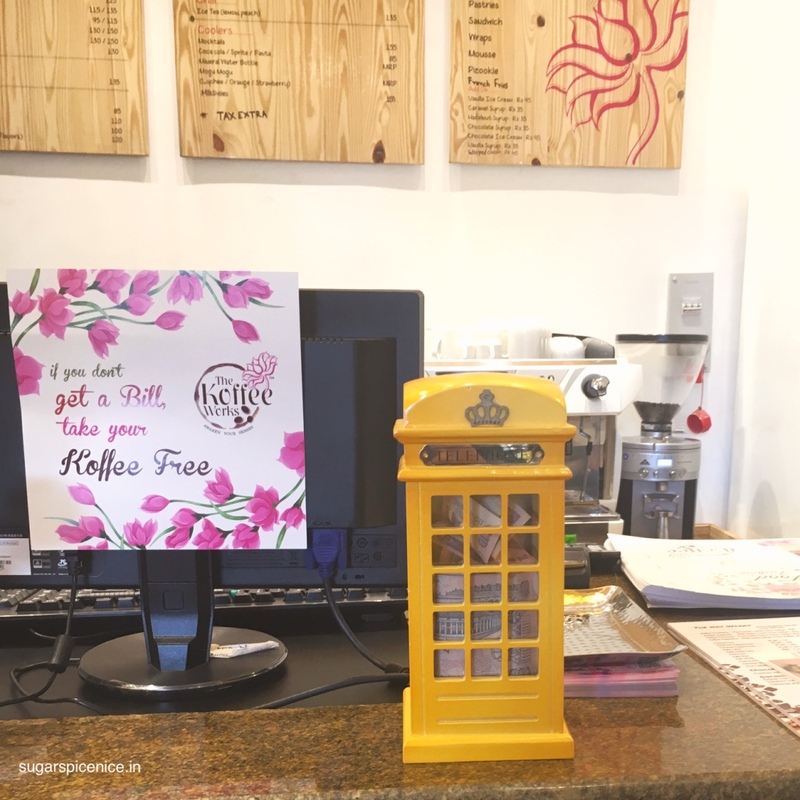 Check out all of the photos that capture my time at The Koffee Works. I hope you enjoyed reading and watching this. And I will see you in another post real soon. In the meantime, stay in touch with me by following me on my social media. All my links are given below. 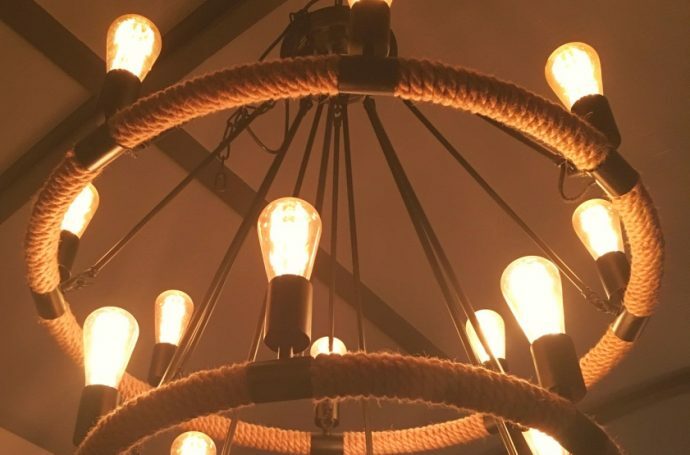 What makes a restaurant grand? Is it just great food? Not in my opinion. So let’s find out if Peninsula Grand is really the grandest of them all! I can describe this as one of the best ones I’ve had. The right amount of crackle in the spinach and the paneer pieces are really nice and soft. 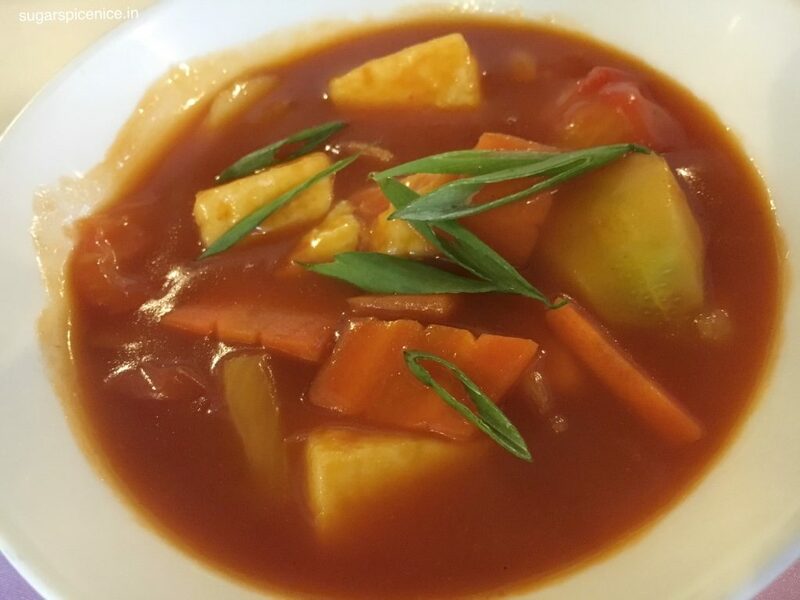 That perfect Indian Chinese flavor is what this dish brings. 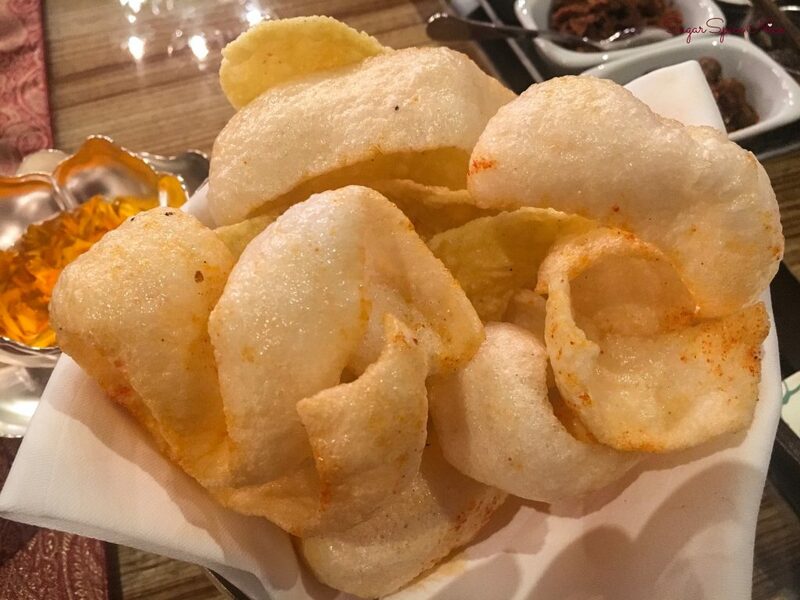 I know my papad well! It’s because I eat it with every meal. 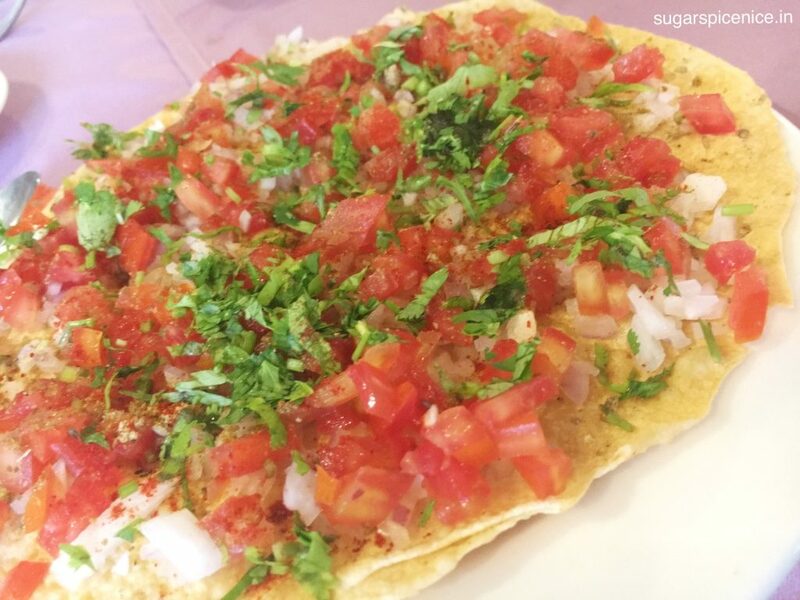 So when someone gives me a perfectly crisp papad, with a blanket of tomatoes, onion and chatpata masalas, I do appreciate it. Great if you have a bad throat, or even otherwise. Slightly on the spicier side though. Thick and has a good amount of vegetable in it. 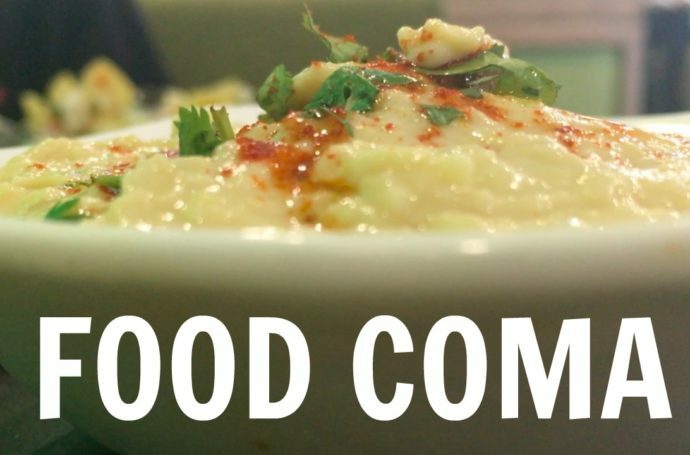 It doesn’t feel like it has absolutely no corn flour, but definitely worth a try. 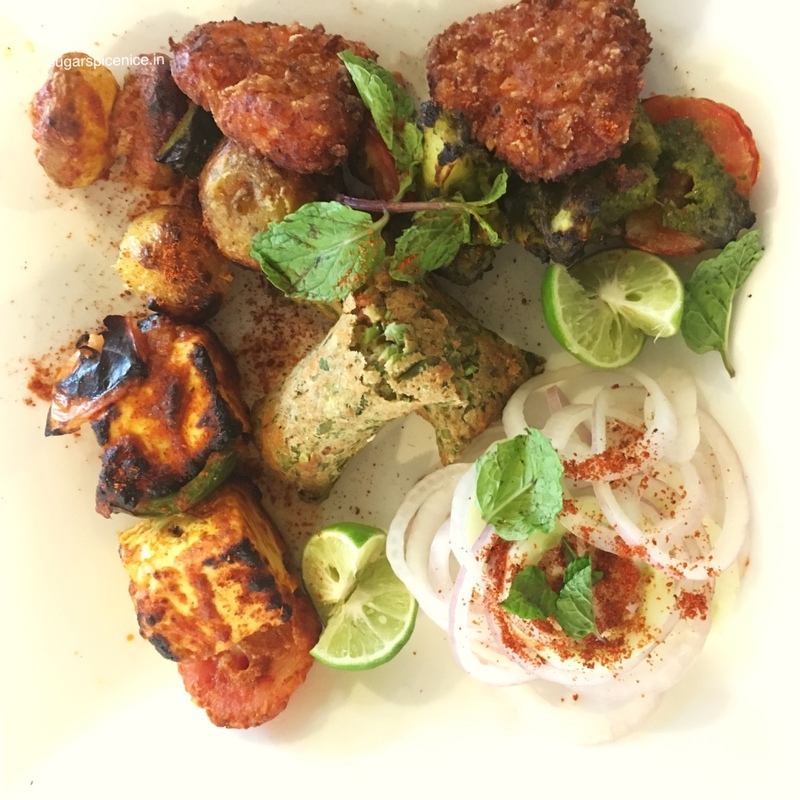 The paneer and the seekh kebabs in this are just heavenly. And honestly the portions are quite a bit. 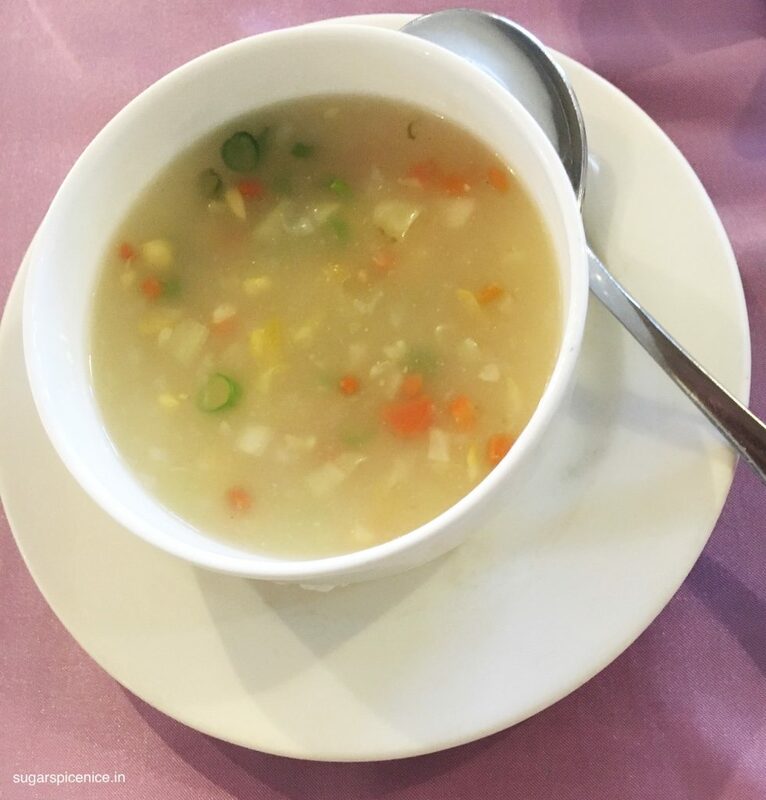 Peninsula Grand does Indian Chinese really well. This gravy was so tasty! Warm boondi, gulab jamun and rabdi. And laden with chopped pistachios. Rich and delicious. The Peninsula Grand also feels different than the other Peninsula brand restaurants in the city. Their service is really good and it does give a feel of dining in a fancy place. Evenings you will see that they have some live music which would be great with their opulent bar selection. All in all, a good family place. Have you been to the Peninsula Grand? Let me know about your experience below. I’m not really the kind of person that loves eating Indian food while eating out. So when I was headed to Veranda Bandra, I didn’t really know what was about to come! 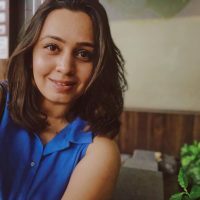 So here I am sharing my experience with you. 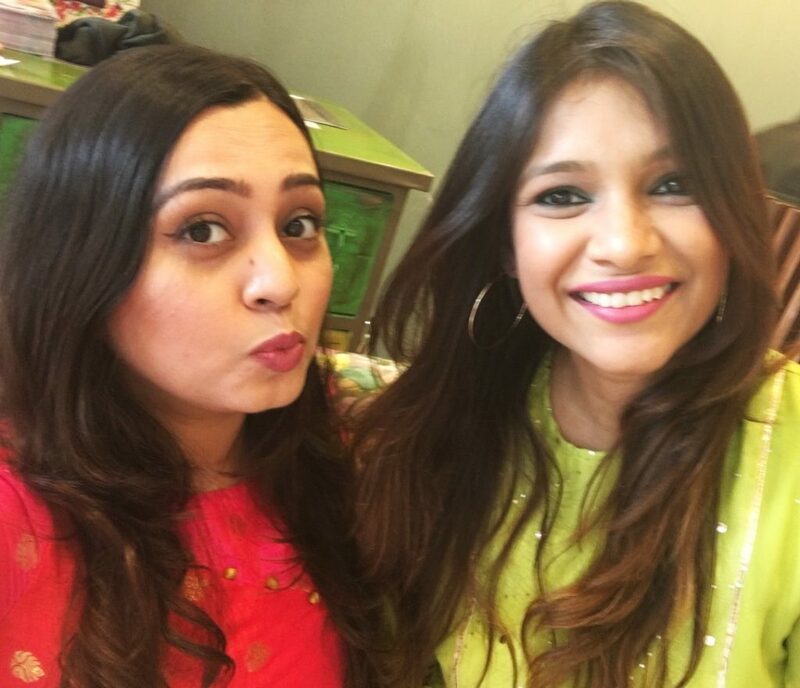 My visit to Veranda Bandra is captured in this video. I hope you enjoy it! 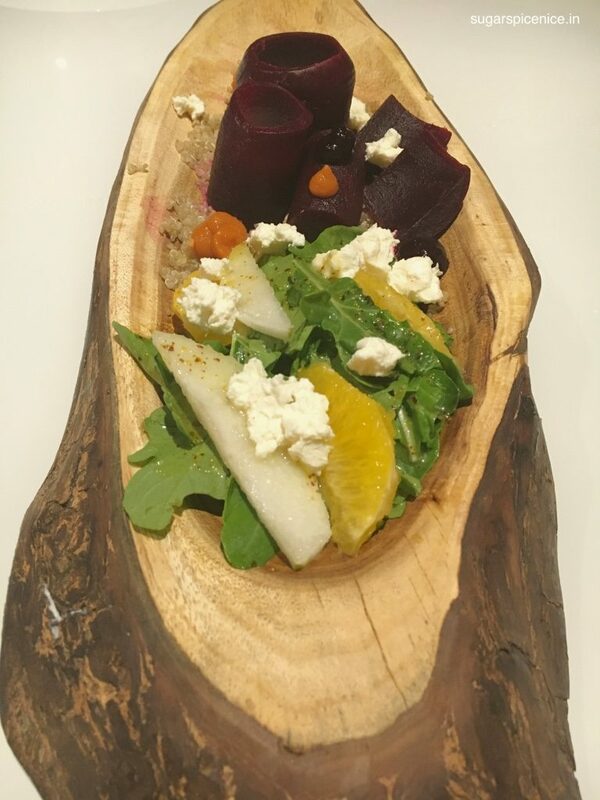 Here’s a description of everything you saw me eat at Veranda Bandra. 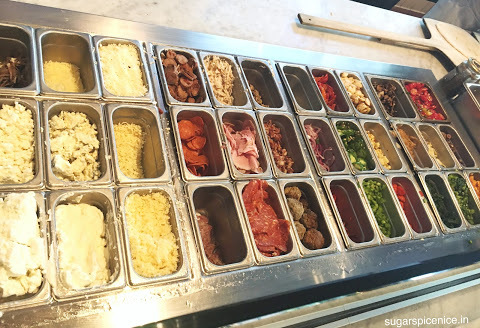 Alternating flavors to help cleanse your palate. That gunpowder is the good stuff! 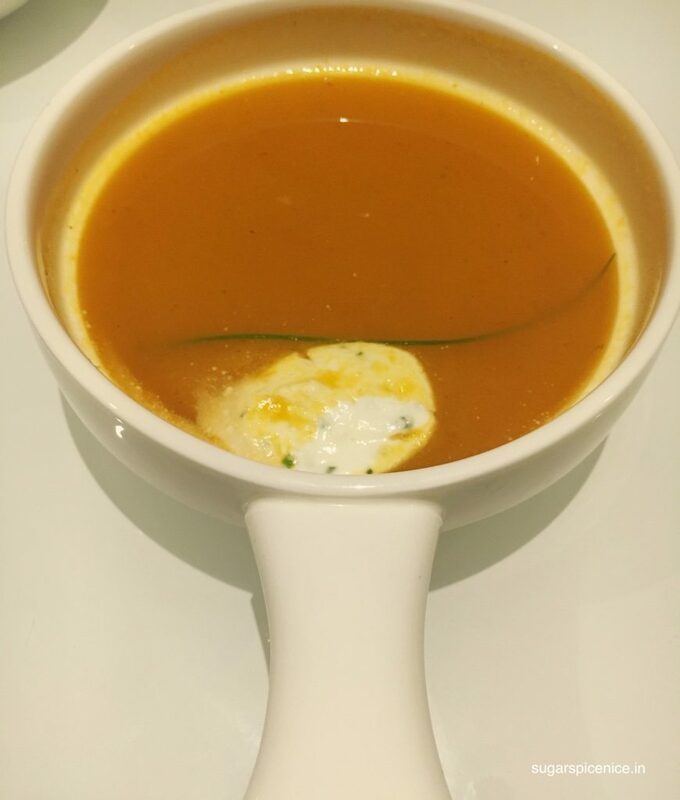 It’s pumpkin soup and it didn’t make me throw up. So yeah! 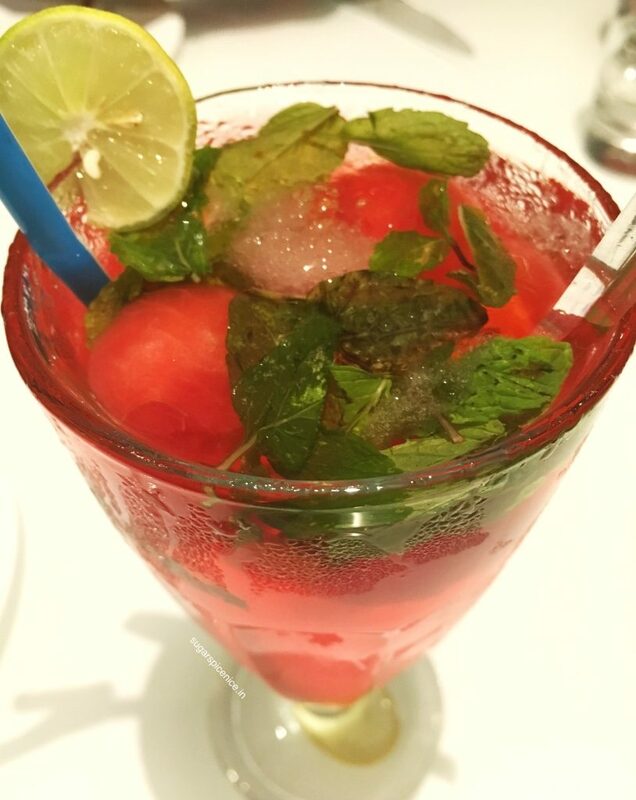 Nothing like minty fresh watermelon with some liquor. It’s a total burst of flavors in your mouth. The salad is oh so fresh. And the beetroot with hung curd is probably the best that beetroot has ever tasted for me. 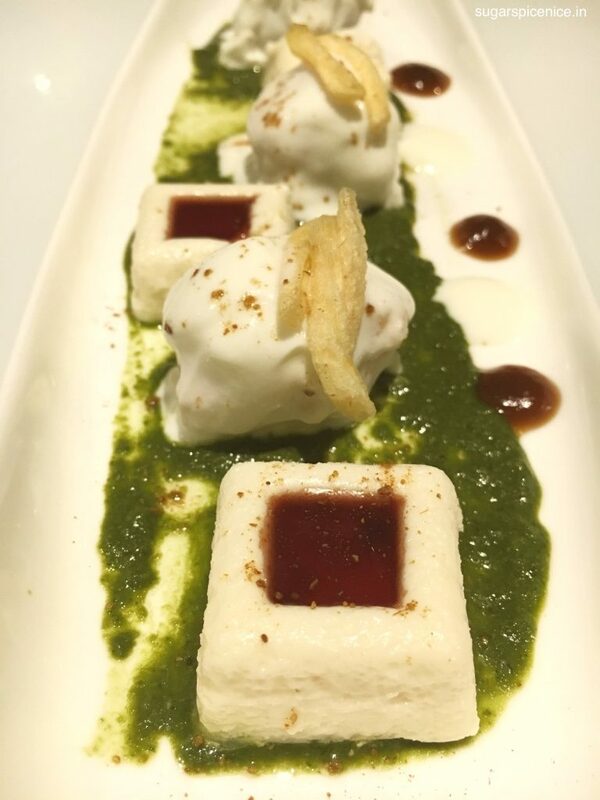 This is a dahi bhalla – but deconstructed! Great taste. 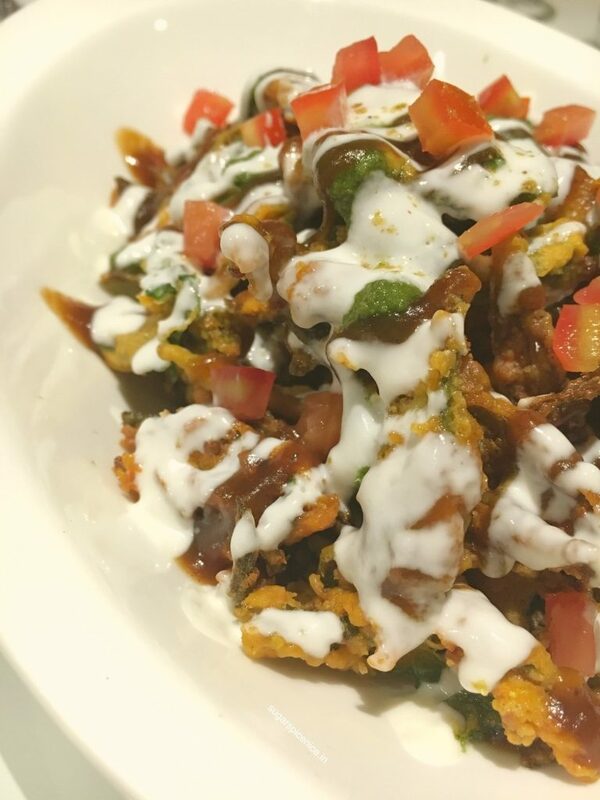 Spinach, fried bhindi, chutneys and hung curd – it’s got everything going on. 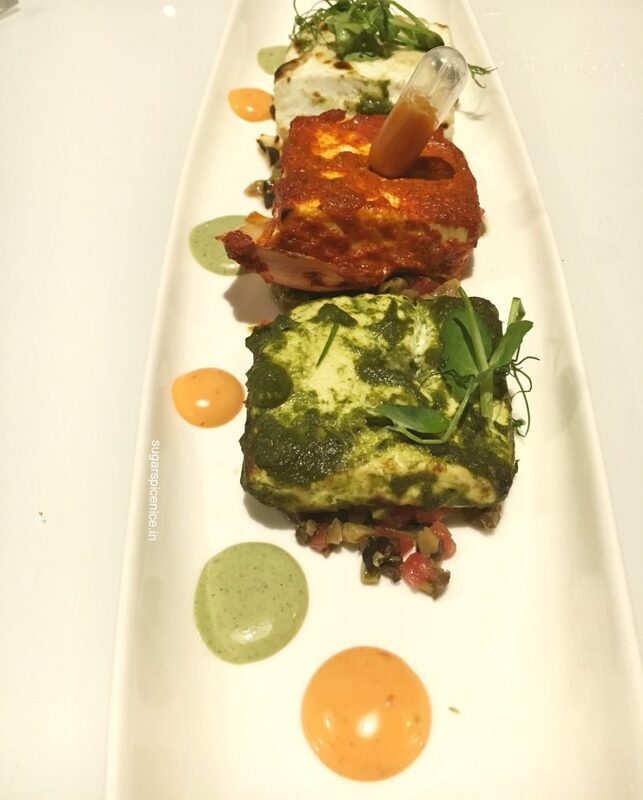 3 Different flavors of paneer – mild, spicy and healthy i.e. with spinach! 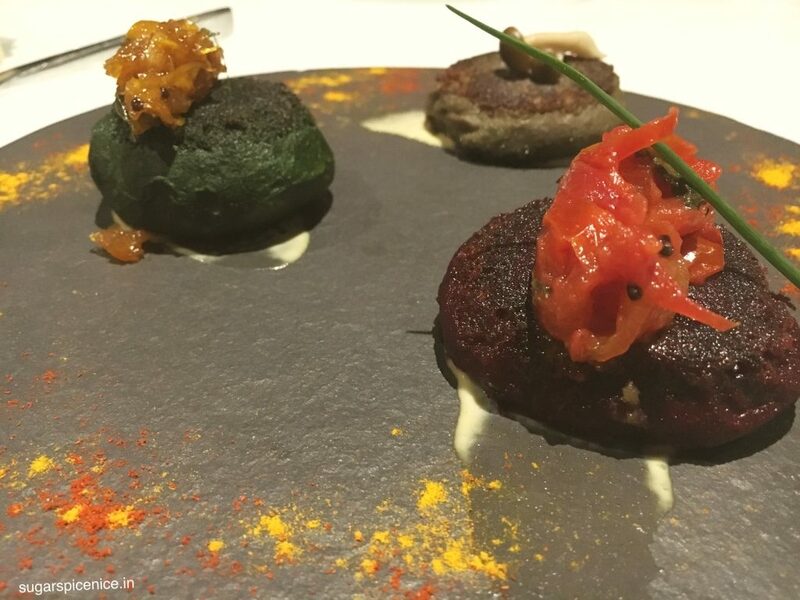 A beetroot kebab with tomato chutney on top, a mushroom one and the best one – a spinach kebab with sweet mango pickle. That pickle is parcel worthy! 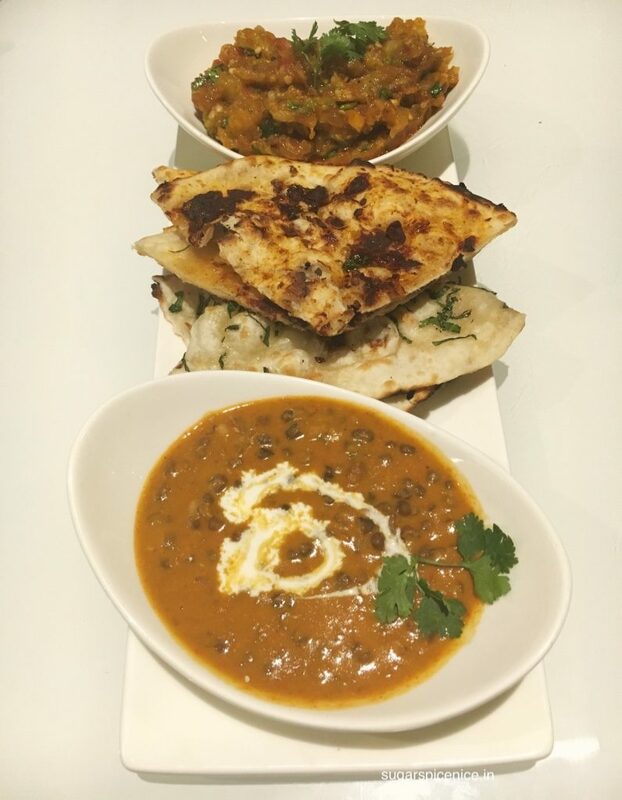 Perfect baingan bharta, tomato and onion kulcha and dal makhni that’s not too heavy. Only thing better than saunf is saunf rolled in chocolate! That’s what I felt about this. Melting goodness. Never knew white chocolate souffle could feel so good. That’s all from my visit to Veranda Bandra. I hope you enjoyed reading and watching. Please stay tuned for more. And in the mean time don’t forget to stay in touch with me on my social media. All links are below. As a food reviewer, anything that I’m doing apart from eating really counts for me. So that’s why it kinda became a big deal for me, when I went for a walk! It was a sort of blah day and I was honestly quite wasting it – watching too much YouTube, sampling too much food and eating too much junk. And then I got out and I went for a WALK. Watch! Walking is something that calms me down – it kind of took away that feeling of doing nothing. And that’s why it became the highlight of my day. 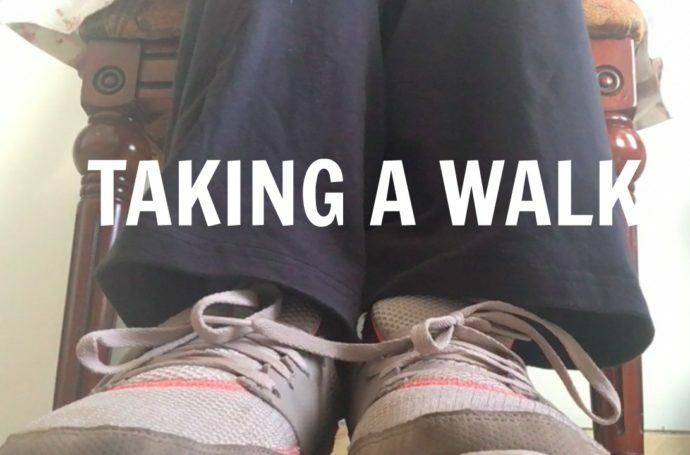 I hope you enjoyed watching my I went for a WALK – VLOG. If you did then please give it a Thumbs Up and also Subscribe to my YouTube channel. Stay tuned for tomorrow’s episode. That feeling when you’ve eaten, wait – overeaten way too much and you are so stuffed and so full that you can’t move, can’t think, can’t talk. Basically can do nothing. That is Food Coma and that is exactly what I experienced when I visited this place one afternoon for lunch. 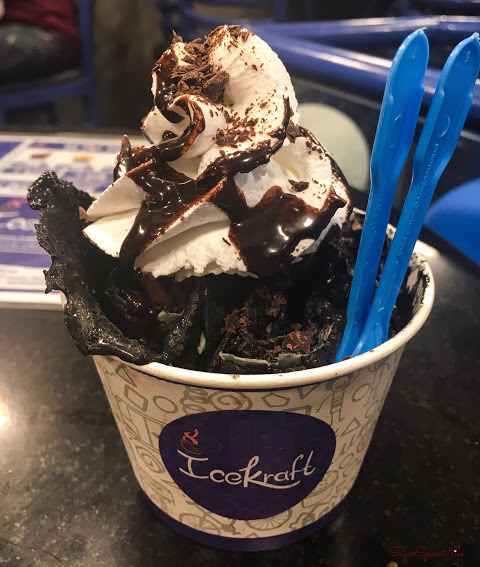 On a weekday afternoon, I was headed to BKC to try out some food from The American Joint and OMG – everything i ate was delicious. 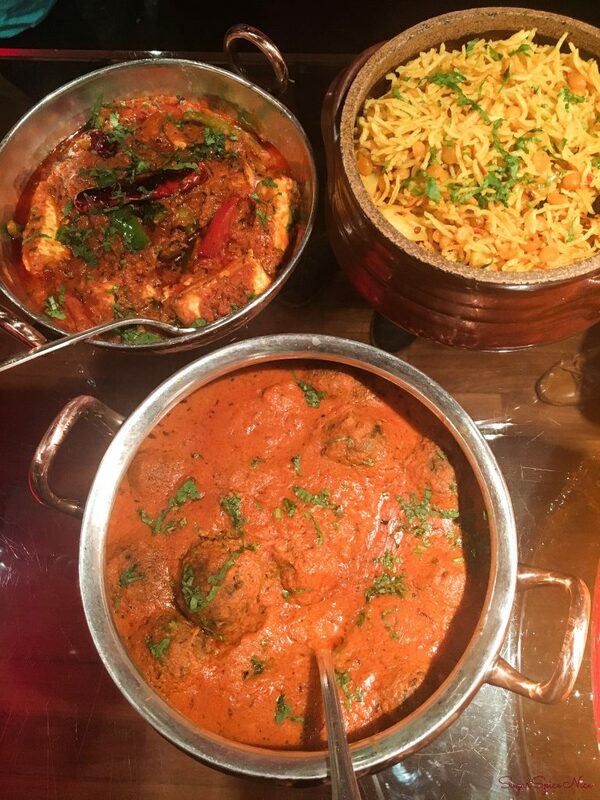 Everything had a really nice Indian kinda flavor going on. My favorites from their menu are the Hummus with warm Pita, Indian Spaghetti, San Francisco Fries and their Paneer Melt. Their food is slightly spicy. You can watch everything I ate in this video right here. And yes what i experienced after this was sheer food coma! I hope you enjoyed watching my Food Coma! If you did then do give this a Thumbs Up and also Subscribe to my YouTube. 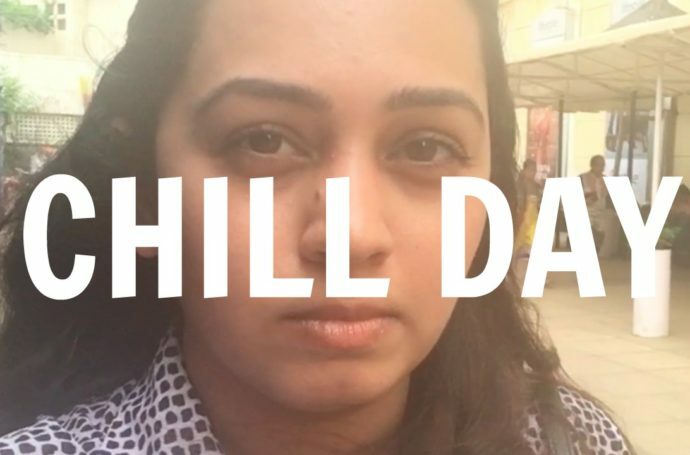 So what is Chill Day Vlog? I just got really inspired to start my daily vlog series – and I’m going to definitely try my best to vlog everyday. This is the first one – it was basically a very chill day. I was mostly with friends, driving around, eating good food. So please watch my CHILL Day VLOG! I hope you enjoyed watching my Chill Day Vlog. If you did then do give this a Thumbs Up and also Subscribe to my YouTube. Travelling makes me really happy. So does food. So here’s a snippet of something that I really enjoyed while I was in Los Angeles recently. 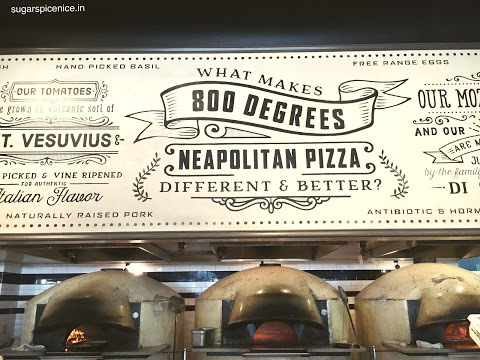 Watch this video from my visit to 800 Degrees Neapolitan Pizzeria in Downtown, LA. And while your at it, do Subscribe to my YouTube channel as well. 800 Degrees Neapolitan Pizzeria was just a couple of blocks from my hotel, and I visited this place one afternoon for lunch. 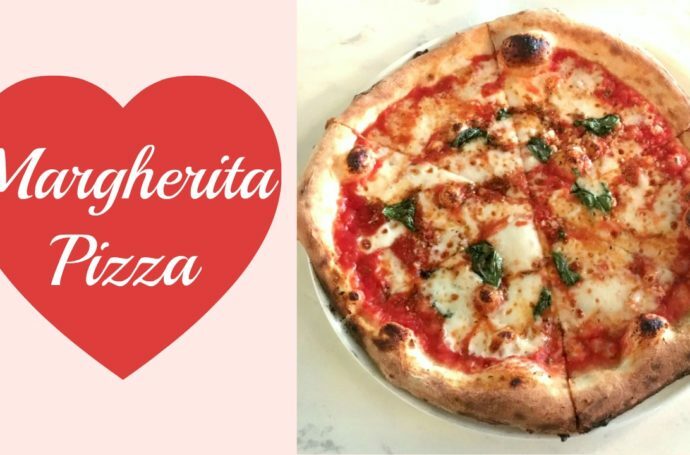 They did have a whole authentic feel going on – open kitchen, multiple huge brick ovens and of course Margherita Pizza! 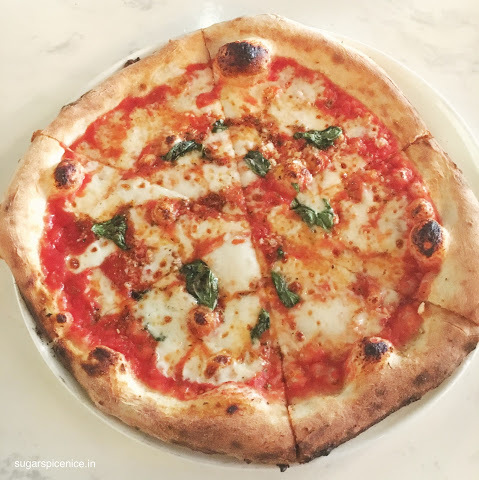 If you have been following me, then you know that I absolutely enjoy a good Margherita – so here I was! And the best part was that I got to film a lot of the pizza being made. That’s how this video came along. 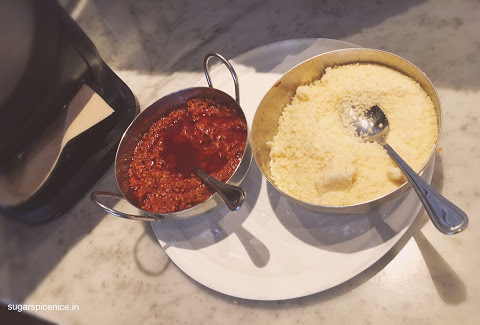 The pizza here was good – kinda soft and soggy like the authentic one, mild sauce and loads of Olive Oil and cheese. It was good pizza and I think I’d rate it a 4 on 5. Here are some more pictures that you can check out from my visit here. 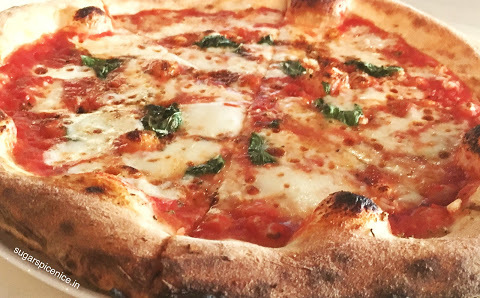 So if you are in Los Angeles, then do visit 800 Degrees Neapolitan Pizzeria. They also had a gelato section, which unfortunately I didn’t end up trying. 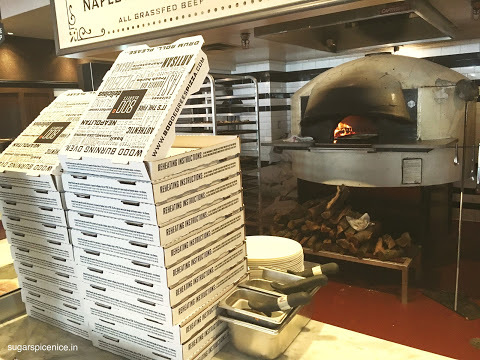 Their pizza is quite nice and a great option if you are looking for a change than the regular American style sliced pizza. And they do have a lot of branches, across countries as well – Las Vegas, Dubai and many more. I hope you enjoyed reading and watching. I know it’s been a while since there was a blog post but there are many interesting ones coming. 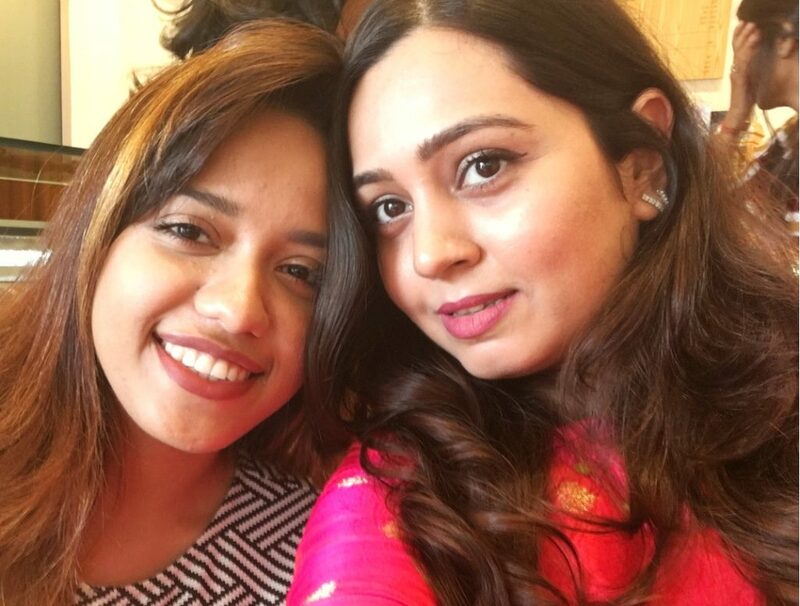 So stay tuned and also subscribe to my YouTube – I do upload videos quite often. And also follow me on my social media. All of the links are below. 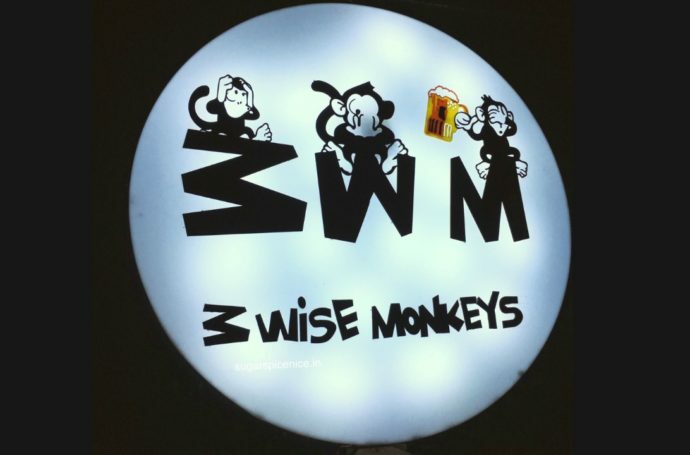 So much fun catching up with Chef Meghnesh from 3 Wise Monkeys. He gives you enough reason to visit this place. Watch! And you can totally take my word and order yourself these items when you are here! I haven’t seen these anywhere yet. But great concept. Fresh fruit and some alcohol together. 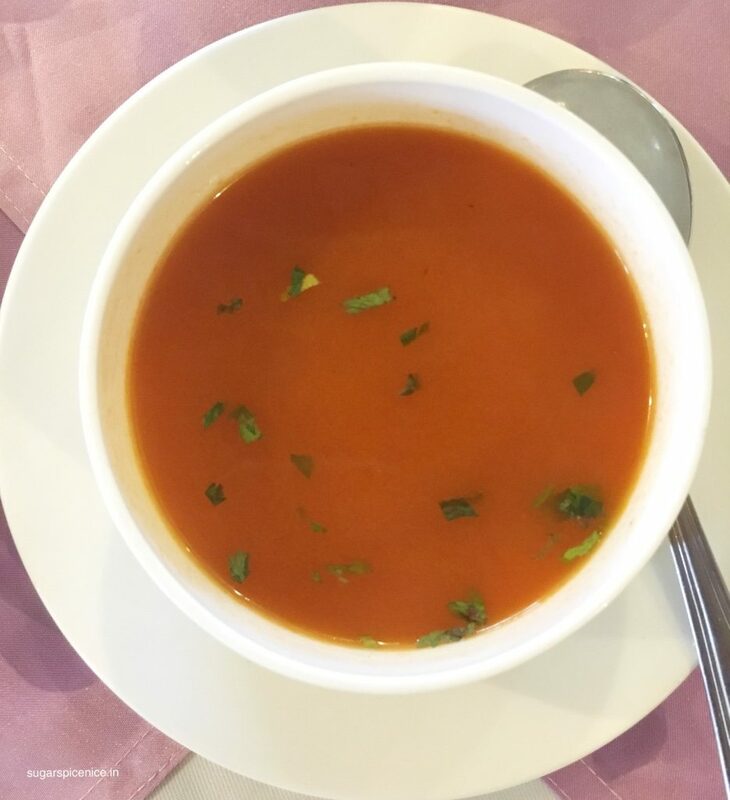 The flavors are nice and refreshing and yet you don’t miss out on the kick! I tried the Cucumber + gin and the Melon + vodka. Melon and vodka was super duper tangy and fruity while Cucumber and gin was refreshing yet not overpowering. I loved both! 5 white spirits in one. This is one mean cocktail and can get you buzzing quite quick! Potato chunks deep fried, loads of masala and some curry leaves for tempering and flavor. 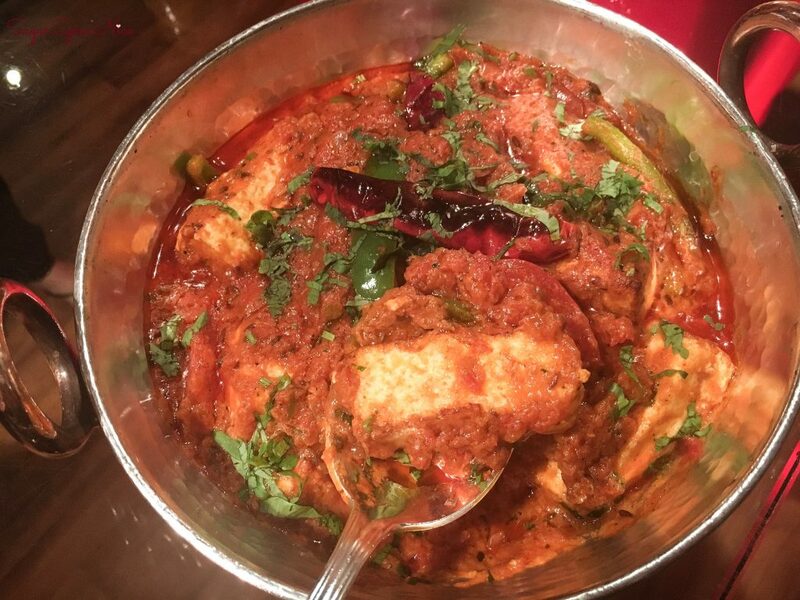 Slightly spicy but oh so delicious! I couldn’t stop eating these. I normally like to have nachos pretty plain – just cheese, salsa and chips. But for a change in quite liked the whole shabam going on with the Mexican nachos here. It had corn, tomatoes, capsicum, cheese and some mayo. Pretty tasty. French fries and pizza – stuff cannot get better than this! French fries that are flavored with some pizza sauce, olives and lots of cheese. Try these for sure. Amazingly yummy..comes in a jar and the Raita is served very interestingly too. Extremely tasty. 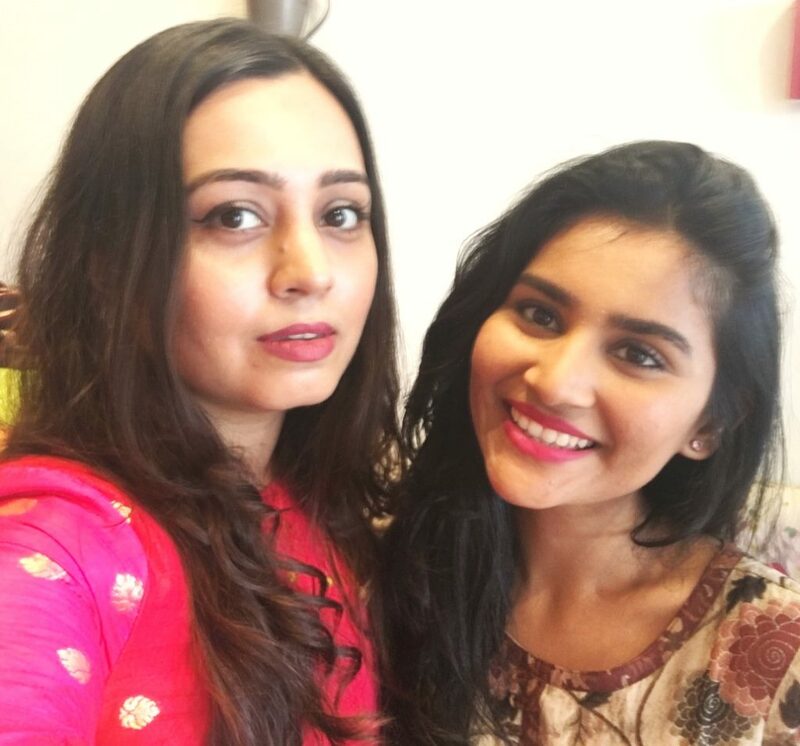 The masalas aren’t overpowering at all. This dessert was literally like the cherry on top of all the amazing food I ate. The combination speaks for itself. You have to try this. Hope you enjoyed watching and reading. What is your favorite place for a chill evening? Let me know in the comments below!